Make your own Twitter banner, Twitter profile photo, pictures for your tweets, and many more images for your social media accounts, with the easiest and quickest tool. 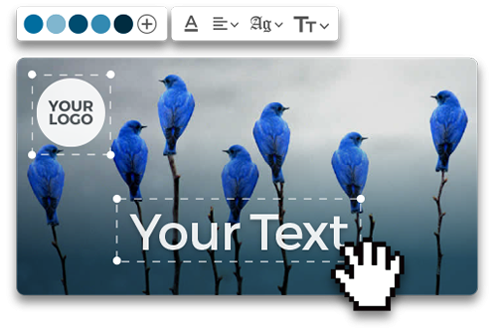 Find the correct Twitter image sizes here and create perfect pictures to share on this social network. Use the correct Twitter profile picture size for both you and your brand account, to appear perfect every time a user, customer, or friend, visits your profile or reads your tweets. Make sure that the images shared on your tweets have these dimensions in order to prevent distortion and quality loss on some devices. Use the banner on your Twitter account to transmit the image of your brand. Optimize it and make sure to use the correct Twitter header size to deliver your message with quality. Twitter is one of the Social Networks that should be included in every Social Media Strategy being that it’s where brands and users can share their new updates in real time. Today we're going to show you how to get the most out of this social network with the help from images! You will learn the advantages of sharing images on your tweets, what the network’s recommended sizes are and the practical tips you need to apply in order to get the most out of your photos on Twitter. Why Should You Include Images in Your Tweets? What Are the Advantages of Doing This? In order to understand the importance of images on Social Media (not just Twitter), we must remember that they are, along with videos, the most shared content around the world. Thus, using them immediately multiplies your engagement. To be more specific, when you publish a tweet without an accompanying image, this doesn't really make your publication stand out to your users from the incessant flow of publications in their feed. On the other hand, sharing tweets accompanied by an image will generate the ever so precious “Stopping Power” you’re looking for to invoke your audience. Meaning, the capability of making people stop and look at your publication instead of the others, all thanks to your image. Employing the use of images on Twitter helps you increase the amount of interactions your publications receive simply because that they help users notice your publications (putting all their attention on your tweet). What Are the Recommended Twitter Image Size? In order to achieve a professional and attractive appearance in your profile and publications, it’s fundamental that you utilize the Twitter image size recommended by the platform. This will enable you to maintain the optimal visual quality of the images you share. ● Twitter Profile Picture: 500x500 pixels. ● Twitter Cover Picture: 1536x768 pixels. ● Post de Twitter (Standard): 900x450 pixels. ● Post de Twitter (Square): 1080x1080 pixels. ● Post de twitter (Links): 520x254 pixels. ● Post de twitter (Cards): 800x320 pixels. Now that you’re acquainted with the recommended sizes for Twitter, let’s move on to the 4 essential tips that you must apply in order to get the most out of your tweets. If you want to increase the number of clicks the links on your site receive (in other words, increase CTR), the best thing to do is to minimize the number of mentions and hashtags you utilize in your tweets so that each of these links can distract your audience from the goal. If you must compose a tweet and are lacking a photo to go with it, one effective solution is to add a GIF to your post. To do so, just click on GIF and search for the percf one to go with your post. 6- Automatically Add a Watermark to Your Images for Twitter: Lastly, the best way to get the most out of the images you share on Twitter in order to better position your brand is to automatically add a watermark to your photos. This will enable you to systemize your strategy and optimize the time you dedicate to this task. So, you can use tools, like Postcron ArtStudio, to create original images for free, with the right dimensions and post them directly to your Twitter account or schedule it with Postcron, adding your watermark automatically. Create the best images with Postcron ArtStudio and Save tons of time scheduling your posts on Twitter and all your social networks with Postcron. Twitter allows you to ensure that all the tweets you create from your website always include an illustrative image. This is where Twitter Cards come in handy by automating the process. A great way of making your Twitter profile more attractive is by adding a tweet with an animated GIF or video to the upper portion of your account. By doing this, the GIF or video will always be displayed automatically which will make your profile more noticeable. Unlike with Instagram where the more hashtags you use, the more exposure you receive, on Twitter it’s best to seldom use hashtags (like 1 to 3) since over doing it will decrease engagement. In order to avoid this, it’s highly recommended that you use hashtags, strategically.